In the heart of London’s West End, surrounded by theatres is One Aldwych, a luxury boutique hotel. However, what is perhaps lesser known is that they do afternoon tea and – more importantly – a pre- and post-theatre menu at Eneko. 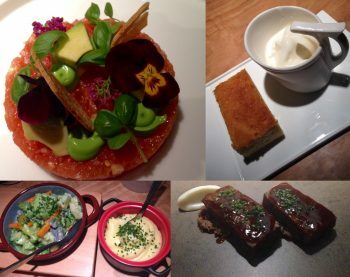 Inspired by the Basque region of Spain, chef Eneko Atxa’s menu takes the flavours of the region and turns them into beautifully presented works of art. And of course, the food is perfectly complemented by an extensive wine choice. While the Basque Country may be well-known for hearty stews, Eneko has chosen slightly lighter dishes with fresh ingredients that ensnare the senses. Staff are polite and friendly, offering plenty of information and insight into the menu. We dined on a beautiful Tomato Tartare and a surprisingly delicate Onion and Garlic Soup, followed by tender Glazed Ox Cheeks and Ceps Ragout (which incorporated crispy, yet creamy egg yolks); both dishes were accompanied by the most delicious Sauteéd Garden Vegetables and Mashed Potato. To end, we enjoyed two traditional Basque desserts – Torrija and Serafina’s Crème – with coffee and jasmine tea.